Meet Pam, a woman who despite being fit and healthy had a large tumour growing adjacent to her spinal cord. This kind of tumour is rare and if left untreated would jeopardize her ability to walk or lead a normal life. Immediate neurosurgery was Pam’s only option. 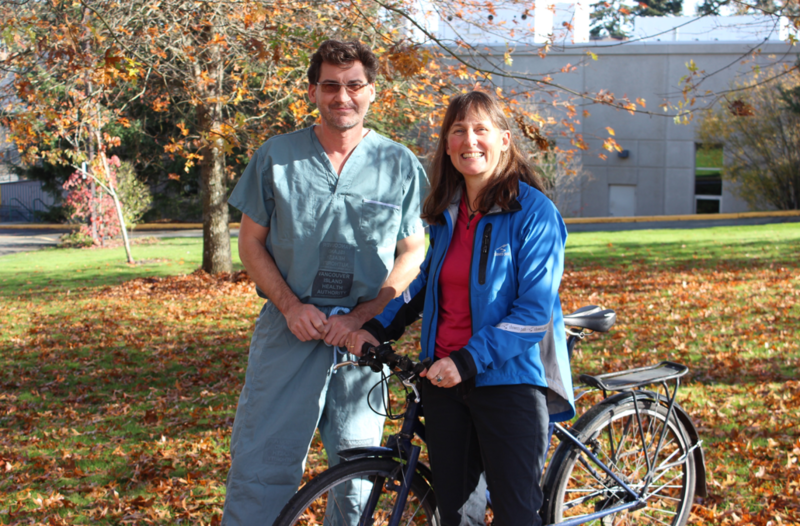 A decade ago, many complex neurosurgical cases like Pam’s would have been sent to Vancouver for surgery. The spine is a delicate area to operate on, and a tumour in close proximity to the spinal cord and many delicate spinal nerves makes the surgery even riskier. Today, medical teams can conduct complex surgeries such as Pam’s right here at Victoria General Hospital. Over the past few years our surgeons have been part of a quiet revolution in care as new technologies make improved surgical procedures possible. We have the talent and the experience we need to keep our patients close to home. I am happiest in the outdoors. Whenever I can, I hike the trails of Vancouver Island, canoe its rivers or ride my bike all around Victoria. I love to explore and push my body to its limit. It’s who I am. But in the spring of 2014, I began to suffer from severe back and leg pain. At first I ignored it, thinking I had pulled a muscle or strained my back. But then I was diagnosed with a rare spinal cord tumour in my lower back. I worried my body had reached a limit it could not overcome. A shift in self-awareness happened in that moment: I went from feeling strong and independent, to vulnerable and frightened. What if I could never ride my bike? What if I lost bladder or bowel function? I was only 53 years old and I had so much more life to live and so many more adventures to experience. Naturally the surgery was nerve-racking. I am a stoic person and have overcome many obstacles in my life but nothing terrified me quite as much as the operation. When I got into that operating room, I remember how confident and calm Dr. Reid’s team was, and that made a world of difference. As I went under anaesthesia, I recognized just how lucky I was to have access to an excellent surgical team right here at home on Vancouver Island. I will never forget the words I heard Dr. Reid speak when I woke up. “It’s all gone. I don’t think it will ever come back.” Relief and hope flooded through me, and I vowed to make the very best out of every new day. Four weeks into recovery, I was back in the pool and before the one-year follow up, I was riding on a 3-day, 200 km cycle tour. The tumour was gone and I was back pushing my body to its limit. As I reflect on this important experience in my life, I can’t help but think about how essential it was for Dr. Reid and his team to have the best equipment possible. Having leading-edge equipment will allow talented surgeons like Dr. Reid and his colleagues to keep providing innovative, sophisticated procedures to patients across Vancouver Island. Please consider taking part in this revolution in surgical care by giving today. You never know when you, your family or friends will need our hospitals.